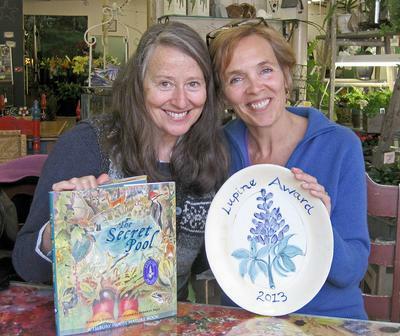 Rebekah Raye, left, and Kim Ridley with their new book The Secret Pool and the 2013 Lupine Award. Photo by Ruby Nash Order prints of selected PBP photos. Writer Kimberly Ridley of Brooklin and artist Rebekah Raye of Blue Hill were among authors and illustrators honored at the 25th annual Reading Round Up conference promoting reading and literature for children and young adults. Four titles received recognition at the conference through the 2014 Lupine Award honoring living authors or illustrators who are residents of Maine or who have created a work prominently featuring Maine, according to a news release from the Maine Library Association. One of the Lupine Award winners in the picture book category is The Secret Pool by author Kimberly Ridley and illustrator Rebekah Raye. The Secret Pool reveals the diversity of life within vernal pools and the changes that occur through the seasons. Reading Round-Up is sponsored by the Maine State Library and organized by a statewide committee of librarians dedicated to promoting literacy and love of reading in children and young adults.